Powers/Abilities: Beelzeboul is a demon and is not necessarily vulnerable to aging, disease and other generally human weaknesses. He was able to open portals to the normal world, though this seemed to be based around the sacrifice of one of his servants. His strength is enhanced to an undefined range, and he can probably alter hit height and appearance. While on Earth, he took a human form to seduce Cassandra Drakonmegas, but whether he had to take over the body of a human or whether he could simply take the form wasn't explored. Like many of the demons claiming to be Satan, Beelzeboul owned his own Hell dimension, and had a large group of creatures that lived there. Like any good demon, Beelzeboul enjoys his items of evil power. His wife would often burn such objects when she found them, but he still seemed to be creating some. One of the more prominent items was the Hellfire Gun. This gun was only usable when either he or his son willed it to be so. Originally he gave it to his officer, Neith, but Terror and Hellfire stole it, and it is currently in Hellfire's possession. (Marvel Zombies: The Book of Angels, Demons & Various Monstrosities/Nightcrawler III#3 (fb) - BTS) - Beelzeboul was one of 14 angels who stood by Lucifer in the war against God. When Lucifer lost and was cast down, he fell into the pit (Hell), dragging his fourteen lieutenants down with him, and the fourteen angels became fourteen demons. (Journey into Unknown Worlds#19) - Beelzebub, as the Arabian Jean, joined the explorer Charles Hagarth on his search for the Book of Satan, a tome that enabled its owner to enslave Beelzebub. For 20 years Beelzebub took the book each time Hagarth was near it and hid it at another location. Around 1963 Hagarth caught Jean stealing the book from the tomb of Assadmaian in Egypt. Hagarth shot Jean, took the tome and summoned Beelzebub, who devoured the surprised Hagarth after revealing that he was Jean all along. Beelzebub then took the book to another hiding place. (Terror INC#5 (fb) - BTS) - Beelzeboul sought to create a son via a human woman, intending that this son would serve as a living battery drawing in the black energy (sin) of mankind, storing it up as a charge of pure evil. This would give the Hell-Lords the power to break through the walls of reality in force and lead to an unstoppable assault on man. (Terror INC#3 (fb) ) - The demon Beelzeboul, in human form, came to Earth, married, and impregnated the human Cassandra Drakonmegas. (Terror INC#5 (fb) ) - Upon finding proof of her husband's demonic nature, Cassandra stabs him with a knife provided by Rekrab, a man very much in the know of the occult world. Being dragged back to his Hell, Beelzeboul hit Cassandra, snapping her neck in the process. As he disappeared, he at least gained some satisfaction in knowing that even if he can't have his son, neither can his wife. Despite her condition, Cassandra fights on to live at least a bit longer, until medics arrive and induce labor on her. Mikal Drakonmegas was born. The use of the mystic dagger, etc. prevented Mikal from gaining the darksoul that would have accomplished the demons' plot. (Terror INC#1 (fb) ) - The international arms dealer, Roger Barbatos, gains an audience with Beelzeboul, who gives him total protection from his enemies in exchange for his soul. (Terror INC#3 - BTS) - Beelzeboul sends several of his agents to a lighthouse on Earth, where he and his wife lived, to bring him his son, Hellfire. (Terror INC#5) - Coming upon Hellfire and Terror, he watched as Terror bit back into his son with the Hellfire Serpent's fangs, draining his Darksoul from him. In exchange for this dead, Beelzeboul hands Terror his contract with Barbatos, and the mercenary departs. Beelzeboul lifts the powerless Mikal Drakonmegas up, and prepares to kill him, when Terror swoops back to save him. Once more, Beelzeboul is stabbed with the knife, this time by his son. The wound opens a portal to Earth, and Terror and Hellfire rush into it, escaping the grasps of (a) devil. (Nightcrawler III#1-3 - BTS, 4) - Beelzeboul joined Pazuzu and other demons of Lucifer's court in a failed bid to access Earth with the help of Louis Childs and his coven. Stopped by Nightcrawler, Seth Walker & Magik he was left trapped in a statue that Magik stashed away in her castle in Otherplace/limbo. Comments: Created by DG Chichester and Jorge Zaffino. Historically, Beelzeboul has been a synonym for Beelzebub, a fallen angel from the Bible. 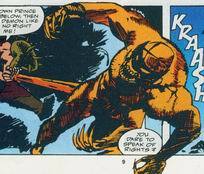 See also the comments on the entry on Marduk Kurios for discussion (ad nauseum) on this issue--Snood. Another good idea is that Satan is actual a conglomeration of demons who merge and split off from each other at different intervals, taking on aspects like Mephisto, Satannish, Thog, Marduk Kurios, Beelzeboul, etc. Thus there could be SOME relationship b/t Hellstorm and Hellfire. One thing I found interesting about the Terror INC series is that there seems to be a lot of similar characters to those already in the Marvel universe, but not quite. With Barbatos you have a bulky crime boss similar to the Kingpin, with Hellfire you have a less experienced Daimon Hellstrom, and with Beelzeboul, you have a dollar store Mephisto. Beelzeboul has been revealed as a member of Lucifer's Inner Circle in Lucifer's profile in Marvel Zombies: The Book of Angels, Demons & Various Monstrosities. 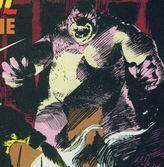 Thanks to Gammatotem for pointing out the appearance in Journey into Unknown Worlds#19. 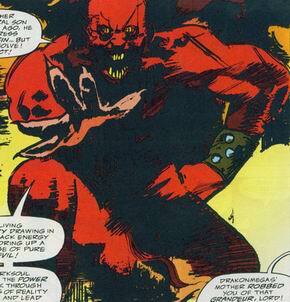 Though the alias Beelzebub was also used by Mephisto on occassion it is more likely that Beelzebub in this appearance was Beelzeboul, whose alternate name is actually Beelzebub. The mother of Mikael Drakonmegas, Hellfire, and former bride of Beelzeboul. In her teenage years, she became pregnant from a boy in her high school. After a horrible abortion experience, it was believed she could no longer bear a child. But after her marriage to Beelzeboul, she found she was indeed pregnant once more. Throughout their marriage, Cassandra found many items which suggested that her husband was more than a man, and whenever she found these items, she would toss them in the fireplace, hoping to burn them out of existence. Somehow, she got into contact with the librarian of the occult, Rekrab, who sent her a knife which could dispatch of her demonic husband. Confronting him, she slashed at him with the knife, cutting him open. Before the knife could have it's desired effect, the demon disguised as a man hit her, snapping her neck. But as he was sent back to his Hell dimension, she fought to hold on to her life, for the sake of her child. When the doctors arrived, there was nothing they could do for her, her spine destroyed from the blow, but they were able to induce labour, and with her death, Mikal Drakonmegas was born. An extremely obese creature, Vulkanus was never one to turn down an opportunity to boast about things he may or may not have actually done. During the battle in the lighthouse, he is the one who caught Cassandra Drakonmegas' eye and ear, which Strigae had stolen from Terror. Returning to Beelzeboul's Hell, he holds a large group of demons in awe, as he tells the heroic tale of how he defeated Terror.